(Nanowerk News) European researchers have developed a new class of electronics that uses noise – normally a problem – as part of the signal. It means better, faster electronics. “It is a tale, Told by an idiot, full of sound and fury, Signifying nothing,” according to Shakespeare’s Macbeth. Of course Shakespeare was speaking about the brevity of life, but his words apply equally to noise in a signal. A signal – any signal – inevitably has some noise, a degree of imprecision that carries no information, literally signifying nothing, and even confusing the underlying data. Most of the time engineers work very hard to ensure a high signal to noise ratio – lots of signal for very little noise. “That is why in commonly used electronics, the signals are boosted well above noise margins,” explains Lukas Worschech, coordinator of the SUBTLE project and a professor at the University of Wurzburg. That is a fine and worthy goal in most applications, but as devices become smaller, and more complex, the noise becomes a greater and greater problem. It is a bit like dots of ink becoming less sharp as they get smaller, as with impressionist paintings. “Electronics is based on switches, which can turn on and off signals. The smaller the switches are, the more complex circuits can be realised,” notes Worschech. Scheme of a quantum-gate transistor realized within the SUBTLE project. Two quantum wells with the upper serving as transistor channel and the lower as gate were grown with atomic precision. Contacts were defined by new undercut technique, which allow to independently control the gate and the channel. It is a problem, and it is setting limits on the miniaturisation, complexity and power of small circuits. Engineers and scientists love limits; it gives them a chance to employ some cunning insight to overcome them. The scientists and engineers at the SUBTLE project have been very cunning, and their solution is subtle indeed. The project sought to use the noise – normally a problem – to boost the signal. The idea relies on a concept called ‘stochastic resonance’ (SR), a phenomena in physics first identified in climatology to explain a pronounced variability within the climatic system, where very small changes can lead to profound impacts, such as a mini-ice age. Stochastic resonance is where a very small variation in a cycle can ‘tune in’ with other periodical variations to create a massive impact. Its application depends on nonlinear systems, where linear inputs do not equate to linear outputs – where the sum is greater than the parts. Applied to signals, the phenomena opens up the opportunity for engineers to ‘force’ signal clarity by tuning noise within it. It offers a possible solution to the problem of noise in extremely small components. The idea is not new and was first mooted some years ago, but making it work is an enormous engineering and scientific challenge. A challenge greeted with gusto by the EU-funded SUBTLE project. The work programme was ambitious; they sought to conceive and create a new class of electronics that uses noise to enhance the signal. “SUBTLE is a STREP project associated with nanoelectronic devices in which quantum-confined electron channels are so closely spaced to each other that tailored feedback action exists,” Worschech notes. This tailored feedback enhances the signal. The devices employ two, allied, phenomena: back action on the channel gate and noise-induced switching. A channel gate is used to route a signal, and back action is like feedback in an audio system. The subsequent noise can be used to switch the circuit from one channel to another. Both required very sophisticated circuit design and fabrication and SUBTLE took full advantage of its partners, who are European leaders in the field. They developed highly novel techniques and pushed the state of the art in a number of domains. 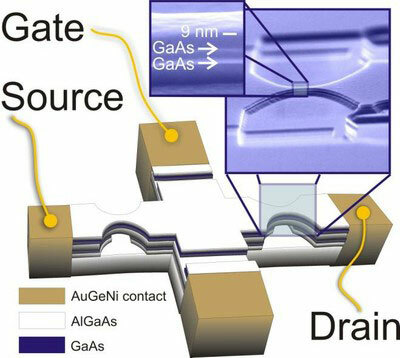 They proved selective etching of independent contacts in a double quantum well structure, creating a quantum gate transistor. It is an extremely complex element at nano-scale dimensions and required molecular beam precision to be realised. These are very sophisticated achievements that enable smaller, cheaper, more power efficient and complex circuits, and they may have application in other fields, too. For example, the SUBTLE team, as part of its work, developed submicron arrays of resonant tunneling diodes that can act as an artificial neuron. These are simple computing, logic gates. Their actions resemble the firing of signals as they are observed between neurons. The SUBTLE team believes that its devices can be thus used in the future to mimic neuron action in artificial networks and to serve as sensors for signals usually hidden under the noise. This work demonstrates starkly the amazing potential of these new sensors. They can operate at less than millivolts, significantly less that the current state of the art. In combination, they could be used to create neural networks, where actions cascade based in part on the noise of individual spiking neurons. This incredible sensitivity makes the devices an ideal candidate for quantum computing. And there’s more. Typical computers focus on output, the result of a sum: 5 + 2 = 7. Conventional computers discard the input – the individual transistor states that give us the binary digits. However, the quantum transistors developed by SUBTLE can morph, or reverse, opening the prospect of maintaining the inputs. “This could be a reversible computer, where you could return to the inputs from the output. It will probably be essential for quantum computing because there will be instances where you need the input,” explains Worschech. These are areas for further research, and the consortium is hoping to set up another project. In the meantime, the project has filed a patent and has been approached by companies that want to build sensors from SUBTLE technology. “These gates work at such low voltages and with so little noise that they are far ahead of the current state of the art in terms of the sensitivity,” Worschech reveals. The wide variety of applications and the intensity of excitement generated by the SUBTLE project demonstrate the importance of its work. It has led to a new class of electronics and a whole host of potential new solutions to old problems. And all from some very subtle insights. The SUBTLE project received funding from the FET- Open strand of the EU’s Sixth Framework Programme for research.